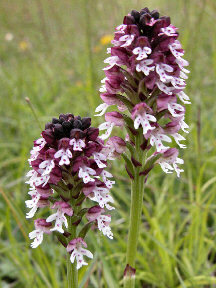 These two plants show colour variations of the same orchid. 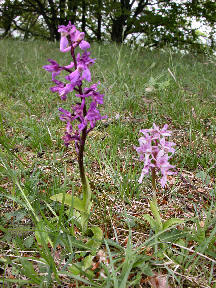 These orchids grow on unfertilized meadows, dry hillsides, bush and open woods, mostly in calciferous soil. 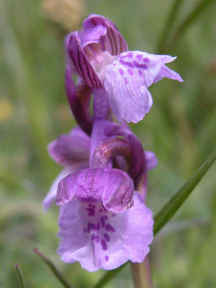 The flower colours range from pale pink to purple, very occasionally white. 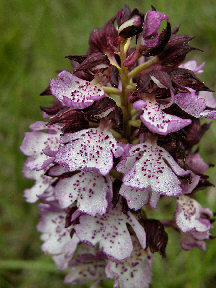 The leaves are spotted as shown here or unspotted as in above photo. 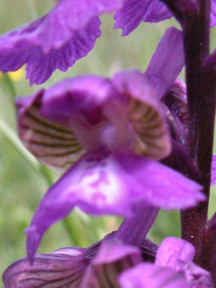 A closeup of a purple flower head. 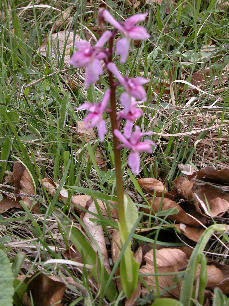 A plant with pink flowers and unspotted leaves. 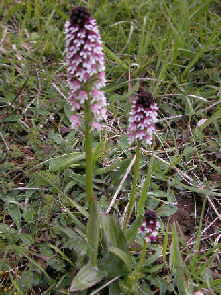 These orchids grow in dry calciferous soil on open hillsides or light woods. 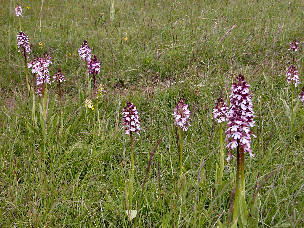 The plants range between one quarter and a half a meter tall. 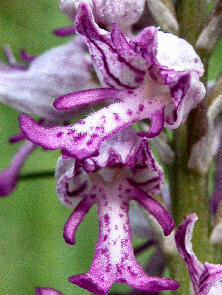 A closeup of 2 flowers which look like little men wearing helmets, hence the name. 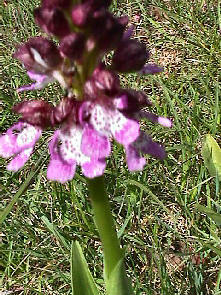 This is the first orchid to bloom in spring in the Eifel.. 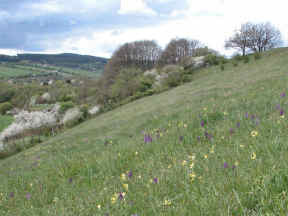 These orchids grow on dry to damp, unfertilized meadows and hillsides on calcium. 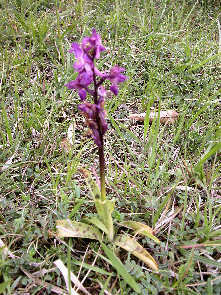 Anacamptis morio was originally grouped in the orchis family but was transferred to anacamptis about 12 years ago, based on new information on its genetic make-up.. 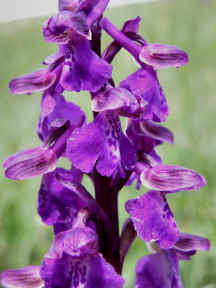 The English name green winged orchid comes from the green striped upper petals forming the helmet.. 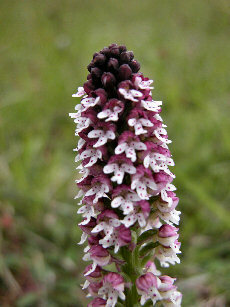 The colour of the flowers ranges from deep purple to mauve or pale pink to white with purple spots or pure white. 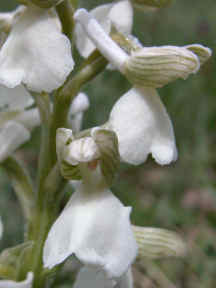 The pure white variant is quite rare. 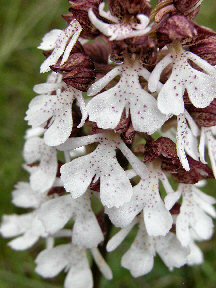 We were lucky and found 2 plants with pure white blossoms. 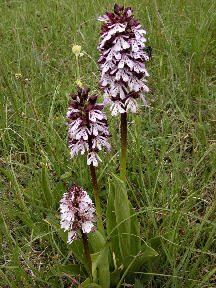 These orchids grow on sunny, dry hillsides, bush and open woods, only in calciferous soil. 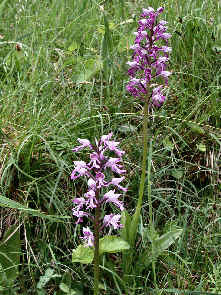 Three orchis purpurea plants and an orchis mascula. 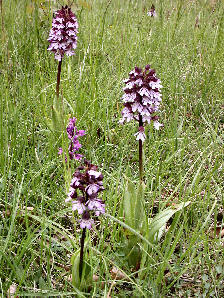 Three orchis purpurea plants showing the variations in the flower colours and forms. 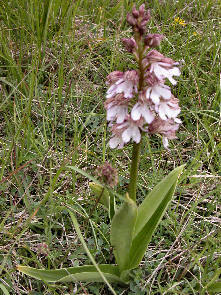 This photo of a single flower shows where the orchid got its name. 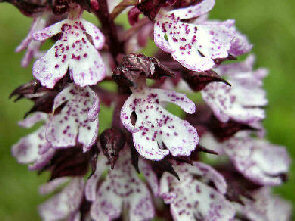 The Latin and German names come from the purple colour of the stem and 3 upper petals that form the "lady's bonnet". 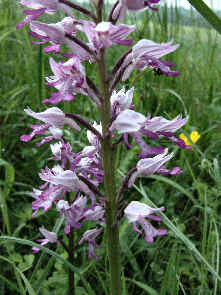 The flower looks like a little lady with 2 arms, a wide skirt often divided in the middle, and wearing a bonnet, hence the English name Lady Orchid. 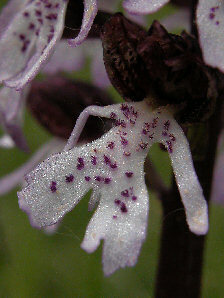 These flowers have almost no divide in the lower petal. 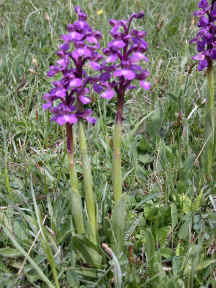 This photo shows the light colour variation: the stem is green and the 3 upper petals are pinkish rather than purple. 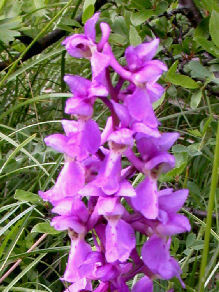 A closeup of the light colour variation. 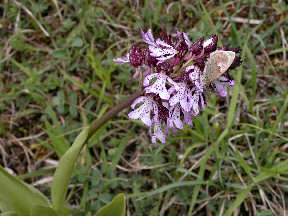 Little ladies with a Blue butterfly.